you know how some characters in some novels just seem totally get into your head? tassie keltjin was like that for me. 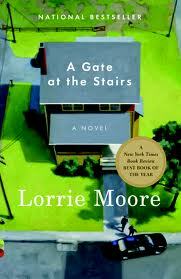 i know that girl so well, I laughed at her jokes before lorrie moore wrote them. here’s the gist: tassie keltjin, part jewish, part secret gourmet potato farm daughter, needs a job during her first year in college. her first year away from the farm, away from her chronically depressed mother, away from her loving father, away from her little brother “gunny”, the perfectly nice farm boy. tass finds a job, through no great effort of her own, as a part-time nanny for a couple adopting a little girl. tassie is trying to find out about the world – and she does: about betrayal, love and loss. war, racism, kindness, and pain. and despite – or because of – this, she tries to do the right thing, stay on course – whatever that course may be. she doesn’t always succeed but her inner hilarious monologue (and sometimes outer monologue) are a true representation of a young girl coming of age in a post 9/11 world. best coming of age novel i’ve ever read from a female perspective. and about time.